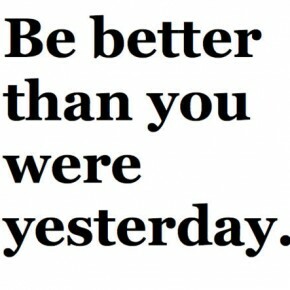 Skinny Jeans Dreams: Be a better you today than you were yesterday. How is everyone doing today?? I am wonderful, as usual. I rarely am un-wonderful LOL yes, I just made up a word. Don't get me wrong, I have things that make me upset in my life and things I don't always agree with but I just try to make the best of life 100% of the time. If my lunch sucked, I thank God for having food. If I don't want to wake up early, I thank God for waking up at all. If my boyfriend makes me upset, I thank God for having a man who loves me unconditionally. If my back hurts, I thank God for having access to medical care. You get the point? So, for those of you who may think "This girl is so giddy all the time, her life must be perfect" - IT'S NOT. I just make the best of it. You should too. Check out this little girl telling herself how awesome her and her life are, we should all strive to be more like her! I was in the elevator last night in my Weight Watchers Lose For Good sweat shirt and an elderly lady said to me "You're not on Weight Watchers, are you? You're so thin!!" ...I was completely caught off guard by that but I responded, "Yes, thanks to Weight Watchers. I have lost 84lbs." The lady Sally that was also in the elevator who knows me said "Oh that's because you had a baby right, that you gained the weight?" ...No, Sally. Far from the reason!! lol She was pretty impressed also because she had thought I was just losing baby weight all this time but always points out that I am getting "quite a figure". Around my family the other night and my aunt says to my cousin, "It's so weird seeing Krystle so thin!" Around my new friends that I met this semester today and got in the convo about WW and they say "I can't even picture you fat!" I think I will have to spend a lot of time consciously soaking this all in once I reach my goal weight. It's a lot to process for an over active brain such as my own! I read a blog today on the WW page about a woman in a WW meeting who was unhappy with the results on the scale and when another member mentioned acknowledging her NSV's, she said "What's the point of NSV'? It only matters what shows up on the scale." .....sadly, that woman stopped coming to the meetings. I've said it before and I'll say it again, I thrive on NSV's - Acknowledge them, relish in them, let them motivate you to work harder! If you're reading and not following, please do. When I reach 100 followers I am doing a giveaway!! Stay tuned for a new poem coming soon about my love affair with Weight Watchers. It's kind of silly! P.s. Don't forget to vote for the video!!!!! I really needed this today thank you!! I am finding myself a little sad because I am not seeing the loss that I was hoping for today on the scale, even though I have already lost 20 lbs. In just 4 weeks and my weigh in isn't until Monday. I should just be happy with how I feel not what the " number" is on the scale. God is right by my side and I hear him saying...."just be happy with how far you've come, you are beautiful." bahaha, that video was too cute. I'm with you, i wish we all approached life the way that little girl did:) Isn't it great hearing your family or friends call you thin? It's so hard to get use to for me also. I still need to work on the way I view MYSELF, b/c that is half the battle!!! !